, an eminent physician, was the son of Peter Dirx, a rich merchant of Amsterdam, where he was born Oct. 11, 1593. He rarely went by his father’s name, having rather whimsically changed it to de Tulp, the name, or probably the sign of a house in which he lived on the emperor’s canal. 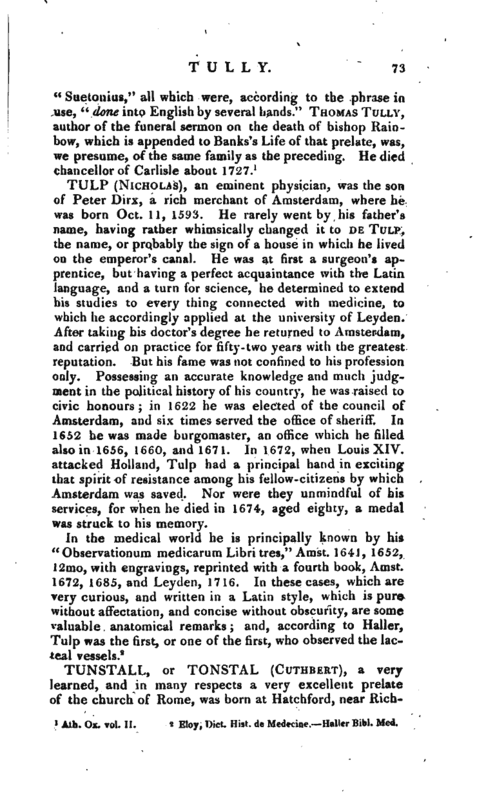 He was at first a surgeon’s apprentice, but having a perfect acquaintance with the Latin language, and a turn for science, he determined to extend his studies to every thing connected with medicine, to which he accordingly applied at the university of Leyden. After taking his doctor’s degree he returned to Amsterdam, and carried on practice for fifty-two years with the greatest reputation. But his fame was not confined to his profession only. Possessing an accurate knowledge and much judgment in the political history of his country, he was raised to civic honours; in 1622 he was elected of the council of Amsterdam, and six times served the office of sheriff. In 1652 he was made burgomaster, an office which he filled also in 1656, 1660, and 1671. In 1672, when Louis XIV. attacked Holland, Tulp had a principal hand in exciting that spirit of resistance among his fellow-citizens by which Amsterdam was saved. Nor were they unmindful of his services, for when he died in 1674, aged eighty, a medal was struck to his memory. Eloy, —Dict. Hist. de Medecine. —Haller Bibl. Med.